So what was David Robinson, last season's National Basketball Association champ, 10 times NBA all-star, born-again Christian philanthropist doing Tuesday, the first day of the 2003-04 NBA basketball regular season? He was on the campus of Sam Houston State University, planning to rush back to San Antonio for a championship ring ceremony at that night's Spurs opener, giving a message that was part coach's pre-game locker room pep talk and part old time tent meeting revival. Plus giving an interesting look into the NBA and some of its big names these days when there are perhaps too many stories about the bad guys connected to the game and too few about the good ones. By almost any measure, David Robinson is one of the good ones. He made the trip to Sam Houston State as a favor to an old friend, SHSU president James Gaertner. Gaertner was business dean at the University of Texas-San Antonio and served as president of the board of Robinson's Carver Academy, to which he devotes a great deal of time, energy and support these days. Robinson told the standing-room only crowd of almost 500 that packed the university's Killinger Auditorium, as well as adjoining rooms for closed-circuit television feeds, that one of his first blessings was his height. He grew 16 inches, he said, from the 9th grade in high school to his four years at the U. S. Naval Academy--from 5-9 to 7-1. That included five inches as a collegian, during a career in which he set NCAA records for most blocks in a game, most blocks in a season, and highest career blocks average. "It's funny how much better a basketball player you become when you go from 6-8 to 7-1," he said. After graduating from the Naval Academy in 1987, he served two years on active duty and picked up the nickname "The Admiral." It was at the Academy that he got his first lessons in what it means to serve. "People now say, 'Don't you feel bad for all these guys, these soldiers who have to go out and fight in Iraq,'" Robinson said. "I think, 'Not at all. This is their chance for significance'...When I left the Naval Academy I would have gladly laid my life down for my country, because that is what they trained me to do." His individual career highlights in the NBA include being named the league's Most Valuable Player in 1995, Defensive Player of the Year in 1992, Rookie of the Year in 1990, and winning the 1991 rebounding title, 1992 blocked shot title, and 1994 scoring title. He was named to the all-NBA first team four times, 1991, 1992, 1995 and 1996. His team accomplishments include the Spurs' two NBA championships, in 1999 and 2003, and winning two gold medals and one bronze as the only male basketball player in U. S. history to appear in three different Olympic games. He said Tuesday that he has never looked back. "When you retire you become a trivial pursuit answer," he told the SHSU audience. "Ten years from now people will be asking, 'Who is the one guy who played in three Olympics?' 'I don't know. Karl Malone?' 'No, it says here some guy named David Robinson.'" Since 1991, June 8, 1991 to be more specific, he said, when he became saved, he has been a different person. From that date he was no longer concerned about his achievements on the basketball court, but how he could serve others and give glory to God. After that day, he said, when he accomplished something as an athlete, he wanted people to not say, "What a great guy this is," but rather, 'What a great God we serve.'" 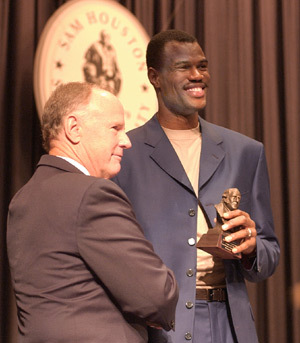 In 1992, as his NBA career was just being established, he and his wife, Valerie, created the David Robinson Foundation, a Christian organization that supports programs that address the physical and spiritual needs of the family. In 1997 the Robinsons announced a $5 million gift to create the Carver Academy, a new independent school serving primarily low-income African-American and Hispanic families on San Antonio's culturally diverse East Side. They donated another $2 million to support the school's construction and fund student scholarships in September 2001 and an additional pledge of $2 million in May 2002 to support the school's permanent endowment. In response to questions from the audience Tuesday Robinson talked about NBA people he knew and the condition of the game in an era when professional athletes are often perceived as selfish, arrogant, overpaid or worse. On Kobe Bryant: "I've been praying for him, and praying for that girl..I'd rather have the truth come out, and deal with the truth." On Michael Jordan: "You've never met anybody like Michael Jordan. This guy is so intense. You'll be at the airport and luggage coming off the thing and he'll be like, 'Hundred dollars mine comes out before yours.'" On Tim Duncan: "What I loved about Tim Duncan--his heart...He's like an assassin. But like a quiet assassin." On LeBron James: "I think he's going to be great. The problem is, he's going to a bad team...the first couple of years may be a bit of a struggle. It's going to be tough." On Avery Johnson, who was traded prior to the 2003 championship season, and how either he or Avery would lead the players in a group prayer, if they chose to participate, before each game. "Man, you should hear this guy pray," said Robinson. "He was hilarious. The guys loved it." They didn't know anything about the Bible, and Avery's prayers didn't help a lot because of his accent and his references, he said. "Shadrach, Meshach and Abednego going into the fire," imitated Robinson in his best fire and brimstone run it all together glory hallelujah style. "And we going into the fire tonight, Lord." "And after the prayer," Robinson said, "all the guys were like, 'What did he say--'Shaq went to Diamond Shamrock and got somethin' to go?'" Robinson encouraged his audience Tuesday as he did those teammates with which he won NBA championships, and who helped him become one of the 50 greatest NBA players of all time--"Use each other. Surround yourself with good people. Get brothers you can walk with...to encourage you and strengthen you." The President's Speaker Series was created in January 2002 to introduce Sam Houston State University students, many of whom are first generation college students, to people who are living successful and principled lives. Previous speakers in the series have included Gene Stallings, Debbie Fields and Dave Dravecky.